This year’s verdict is out! Punxsutawney Phil emerged from his warm home this morning and could not find his shadow. And yes, that means spring is just around the corner for the rest of us. Hard to imagine when we’ve been bombarded with so many snow and ice storms lately. In honor of Punxsutawney Phil and Groundhog Day, we’ve gathered for you a few interesting details on the filming locations of our beloved Groundhog Day movie (1992-93), starring Bill Murray and Andie MacDowell. 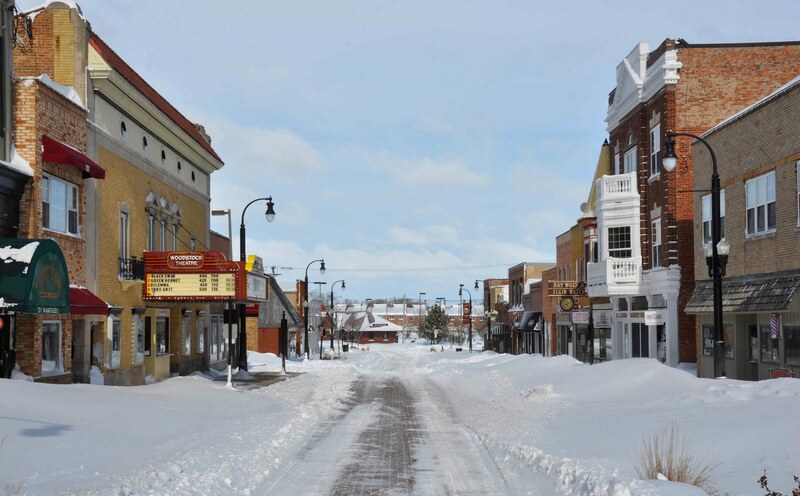 Image of Woodstock, Illinois via Google. WI: How was Woodstock eventually chosen as the primary location for “Groundhog Day”? BH: I had worked in Woodstock once before. We did a few days of work on Planes, Trains and Automobiles there. So I was familiar with the town. It’s a quintessential, little beautiful town, but it was a little far outside the zone for most productions. My job is to provide options to the production designer and director for them to make decisions of where to shoot. Woodstock was one of the very first towns I sent photos of because I already had it in my files. Immediately the word came back from Harold [Ramis] that he was looking for a main street town like Puxsutawney rather than a town square. We were searching for a drop dead duplicate of Puxsutawney, which made my work very hard. Mineral Point, Wis., seemed to be our best bet, and on the trip up there, we stopped for lunch in Baraboo. When we pulled in their town square, the filmmakers began to embrace the concept of a square for their location. Groundhog Day is a mythical movie, it’s not a fact-based film. There’s a bigger metaphor to be found in a town square where a character can be trapped. It’s like a cage with the main character circling the inside of it. So Harold asked me, “Is there a town square like this that’s closer to Chicago?” Next morning, we went to Woodstock, and 10 minutes after pulling into town, I asked John Scharres if we could go up to the bell tower of the Opera House. The decision was made that quickly. We had looked at 60 other towns, so this was the most thorough town research scout I had ever done in my filmmaking career. WI: How challenging was it to shoot the Groundhog festival sequences on the Square? BH: It would’ve been a whole lot easier to do those scenes out in the woods where we could’ve totally sequestered ourselves. In McHenry we had found a forest preserve that was going to be our Puxsutawney Woods. I remember one day walking out of the Opera House with the production designer, David [Nichols], and looking at the Square. Suddenly my worst fears were coming true. In my line of work, I have a three-day rule. I can make any film anywhere for three days. After that, it’s like when your family comes over to visit, and you’re ready to have them go. When David broached the concept of taking the biggest scene in the film, the one we repeat over and over again with thousands of extras, from a forest preserve to a town square, I blanched. My job went from interesting to the most challenging job I’ve ever had. We had 115, 120 contracts on the Square because we had to run cable across the rooftops of the entire town square. We took over storefronts. It went from very little impact to a very substantial amount of impact on the town. So my job was to talk everybody into doing that. It’s difficult to get people to understand how filmmaking is an evolving process. When you tell a community that you’re not entirely sure what you’re going to do there, it makes them extremely nervous. It got to a point where people thought we were lying to them, and the fact is, we never lied, but we didn’t know what our truth was. Mixed emotions or not, the filming of Groundhog Day was a big occasion for Woodstock residents. During the filming of the movie, many town locals even brought out their own heaters to keep the cast and crew warm since the movie was shot in the middle of winter. Ever since the making of Groundhog Day in 1992, each year Woodstock residents still get together to celebrate Groundhog Day. Woodstock has its own Groundhog Day festival, complete with a dinner dance, free showings of the movie, and a walking tour of some of the sites where the movie was filmed. Speaking of the its filming locations, The Tip Top Cafe, where much of the filming takes place was originally a film set created specifically for Groundhog Day, but after the movie was made, the cafe’s popularity resulted in a real-life cafe, The Tip Top Bistro. We heard through the grapevine that The Tip Top Bistro is now Bella’s Gelateria, a coffee and Italian ice cream shop. As to the Cherry Street Inn where Phil Connors was staying in the movie, at the time of the filming, the inn was actually a 114-year-old Queen Anne-Victorian private home. Today, it’s a real bed & breakfast, The Royal Victorian Manor Bed & Breakfast. Image of the house where Groundhog Day was filmed - via Google. 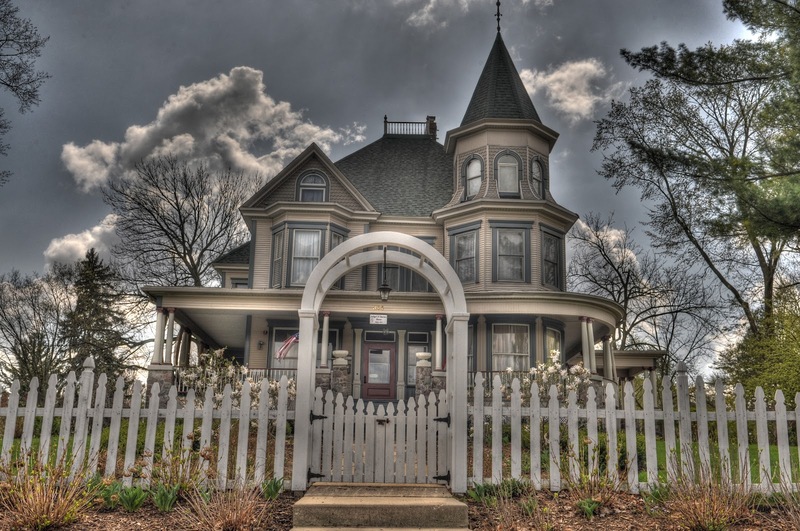 The Royall Victorian Manor B&B proudly states on the homepage of its website: Featured as the “The Cherry Street Inn” in the movie “Groundhog Day” (1992), this majestic painted lady is designed to cater to the discerning traveler. Located in Woodstock, Illinois, the Manor is celebrated as a historic and cultural vacation retreat. The Groundhog Day walking tour via Google. Woodstock Theatre (movie theatre exterior). The interior of Moose Lodge, located at the north-east corner of Clay and Newell Streets (where the dance scene was set). The private residential houses near the Cherry Street Inn and the piano teacher’s house - at the very south end of Madison Street and 348 Madison Street. For those of you who live overseas or who are unfamiliar with the Groundhog Day tradition widely celebrated in the U.S., here it is in a nutshell.